Seating a crown on an implant abutment is not the same as seating a crown on a natural tooth. Establishing proper interproximal contact strength may be more difficult with an implant restoration and may frustrate the dentist. Consideration of the different clinical conditions will show the best way to achieve success quickly and predictably. Interproximal contacts are developed when the restoration is bigger in the mesio-distal dimension than the space into which it is placed. If the restoration is too small, the contact will be open or not give resistance to the passage of floss. If it is too large, the restoration will not fit during try-in. 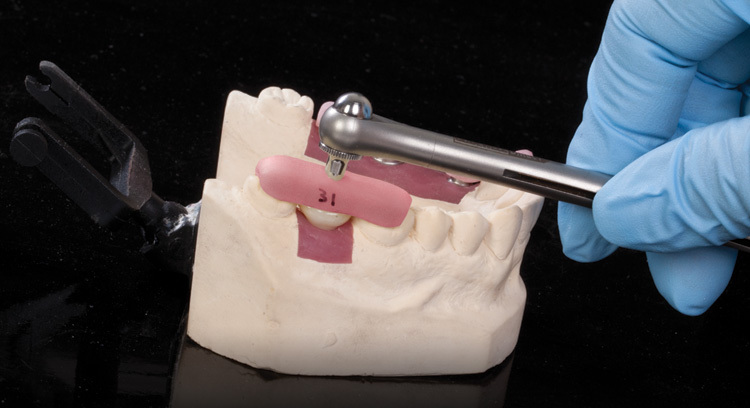 The goal is to achieve interproximal contacts that are correct in strength as well as location. When a crown is placed on a natural tooth, the tooth and its neighbors all shift slightly to accommodate placement of the oversized restoration. The adjacent teeth are slightly displaced and the tooth with the restoration self-centers in the space. Because of the movement of the prepared tooth, it is possible to achieve success with a contact that is slightly heavier on one side or the other. The pressure evens out very quickly. Unfortunately, this is not the case with crowns placed on implant abutments. As a crown is seated on an implant, the neighboring teeth may move, but the implant does not. Consequently, the contact strengths on the mesial and distal need to be adjusted independently. Also, the amount by which the crown is oversized should be slightly less than for a natural tooth. Methods of disclosing the areas of contact are the same as with restorations on teeth, but care must be taken not to overadjust one side until the other has been tested. Powder spray is often very useful as an aid to identifying areas of contact during try-in. Adjustment and subsequent polishing with abrasive rubber wheels are usually very effective. It is also important to remember that in most cases, patients have local anesthesia for the seating of a crown on a tooth, but not on an implant. The duration of anesthesia is usually longer than the time it takes for the tooth and its neighbors to accommodate to the pressure of the contacts. Since the teeth adjacent to an implant are seldom anesthetized, the patient is likely to feel pressure as the crown is seated. This is normal and will pass very quickly, but the patient should be advised of this before the crown is seated. The same type of sensation may occur in the teeth opposing a crown placed on an implant that has not had a provisional restoration. Since the implant has no periodontal ligament, the occlusal sensation is primarily from the opposing tooth. The patient may feel that the crown “is high,” while it actually may have the desired occlusal contact points. If the dentist is confident that the occlusal and excursive contacts are correct, the patient should be assured that he or she will adjust to it quickly. Sensation of overpressure that persists longer than 48 hours should be addressed. Proximal contact strength is seldom prescribed by the dentist or measured by the laboratory technician. For traditional laboratory procedures, the experienced technician scrapes small amounts of stone from the approximating surfaces of the teeth adjacent to the crown. With CAD/CAM restorations and virtual models, the amount of oversizing is specified during the design steps. While an attempt may be made to reduce the amount of adjustment, the interproximal contacts of crowns placed on implants may require a little more attention at delivery. Knowing this beforehand allows the dentist to proceed quickly and reach the desired contact strength for every restoration, while keeping the patient advised as to what to expect. Edward R. Schlissel, DDS, MS, received a BA from Brooklyn College, a DDS from the University of Buffalo, and a master’s of science in materials science from the College of Engineering and Applied Science, Stony Brook University. He is a member of Omicron Kappa Upsilon and a fellow of the Academy of General Dentistry. Dr. Schlissel is professor emeritus of general dentistry, School of Dental Medicine, Stony Brook University, where he was chair, Department of General Dentistry. He is also a clinical assistant professor of surgery, Emory University, Department of Oral and Maxillofacial Surgery. Dr. Schlissel currently practices dentistry in Marietta, Ga.